The Citadel at Nordvorn is doing very nicely. A bit more each day, and just shy of $1500 to the first stretch goal. 405 actual backers, which exceeds where we were on Hall of Judgment four days before the campaign closed . . . and we have twice as much time remaining! Speaking of those last four days on HoJ . . . we added 122 backers and $3300 in that period. So that’s one measure of where we might get. On the other side, there’s $12,500 in latent backers – those following but not pledged yet pledged! Though we probably wont’ get all of them, I hope to get many! And note that total, plus the actual pledges of about $14,500, significantly eclipses the $25,000 stretch goal by quite a lot. Do I smell offset printing in the air? Rick turned in his final version of the cover (and got paid that day, because when folks do good work for you, you pay them right away). I’ve put in some draft “ad copy” for the left-hand side of the book. It’s being revised and edited for maximum “bite” but as is, this cover could go to print. I believe even the ISBN is accurate. I’ve also given out all of the art direction for the parts of the book that are complete, and sent contracts to all of my artists. All have responded positively to the suggestions, and a few have come right back with “but how about this instead?” which I love. These guys are pros . . . I am one level above stick figures. So we should see some really fine, fine pieces from the team, and I’m looking forward to seeing them develop. Until then . . . keep spreading the word about the Citadel at Nordvorn, and back Dungeon Fantasy Monsters 2 as well! I’m working through The Citadel at Nordvorn looking at art spaces, layout, and flow. I’ve settled on a reasonable style for some things, like text boxes and I’ve got some art placeholders there. The campaign is at 89% funding, and could use a few more pledges to move it from “over 300 folks are watching and may come in at the end” to “definitely funded; how many stretch goals can we smash?” Also got a WIP update on the cover! You’ll recognize some of these as pulls from Dean Spencer’s art catalog. While these are low-resolution pulls from his catalog right now, I love his work and will be making use of more of it. However, it’s not all stock art, and doing layout at this stage gives me a chance to work bespoke art spaces into the book. Klifrið (July). When the weather is as warm as it gets in Norðlond, the citizens of Norðvörn celebrate Klifrið: The Climb. Each climber attempts to scale, without ropes or tools, as far up the gorge as they can manage. Whomever climbs the highest wins a substantial prize, taken from the $50 entry fee for each climber. Spectators place side-bets, factions sponsor climbers, make boasts and taunts, and generally work out a lot of frustration brought on by the heat. Rowing and boating contests and other water sports, including an upstream-swimming competition (the laxsund), take place in the river gorge as well. Spectators row themselves out on barges or rafts to watch the competitors. Finally, this is the piece of art that inspired an entire section of this setting, the misbehaving Jarl Gunnulf Bjornöxl of Áinferill. Wow. Public displays of private behavior, while his daughter looks on disapprovingly. He’s done the unforgivable . . . no, not that. He’s left his weapons behind. That just won’t do, and is that a jealous paramour pulling a knife? This is, for me, the fun part. Putting it all together as it starts to look less like a jumble of pieces and more like what’s going to be a real book. We’re doing really quite well. We have two full weeks left in the campaign, and the Dungeon Fantasy Monsters 2/Box Set Reprint Kickstarter ends just before mine does. We’re already the second most successful Kickstarter I’ve run to date, and there’s enough “latent” interest – people following the campaign who have not yet backed – to make it likely it will be the best one yet, from a total number of backers perspective. In fact, it’s getting close enough where it’s starting to make significant financial sense to pull in that offset print run stretch goal. Somewhere around 550-600 print copies ordered, and the offset run is not just the best quality (sewn lay-flat binding! 100# matte paper! ), but it’s the most affordable too. And that would mean Citadel gets to sit on store shelves. Which you gotta admit would be spiffy. One last image. Rick Troula, who did the image of the jarl above, is hard at work on the cover. I’ve pestered him into revealing a work-in-progress image. It’s going to be pretty. Rick wants to remind folks that he’s barely touched the characters and trolls: They are just base painted. And there’re a lot of atmospheric stuff to happen and better light and shadow all around. So other than the fact that this is a very low resolution image, it’s not done, and the like . . . this is where we’re headed. This may be a mistake, but I’m willing to show you guys my crappy whiteboard art direction for the Citadel at Norðvorn Kickstarter if you promise me not to flee in terror. I’ve tried to make some references for my artists, as well as things to keep my writing consistent. So, when I say “this is a setting,” what I mean is that I have in mind some of the lovely and inspirational detail in worlds like Harn, which I experienced with Rob Conley playing in his game. This was my initial sketch of the citadel. I wanted it to be very not-square, something that marks it as a dwarf-hewn keep. I also wanted it big – one of the most impressive castles and structures. I tended to look up “how big was a castle wall/tower/keep,” find the biggest one, and then make this bigger. For example, the Great Wall of China is about 5m wide and 8m tall. Audreyn’s Wall is thus 10m x 10m, but not exactly square. What the heck is an aircraft carrier doing there? Scale. It’s a gigantic ship, 330m or so long (1,000-ish feet) and shows that the inner courtyard contains nearly six acres of space. That’s a big inner bailey! I’ve also worked out where the major “where do I shop” things happen here in the Lower Town, and that gets a solid section in the writeup. Remember, though: Norðvorn is a city, but not Town – adventure can and should happen here! If it’s time to rest your head, where do you go? A bit of research led me to believe that when focusing on the traditional “fantasy Inn,” I was vastly underscoping how much money and importance these places were. Matt Riggsby probably already knew all this, but it was new to me! So I made sure each of the major Inns had its own thing going on, and that the owners had their own quirks and character, and ties to the workings of the town. Also: for those that want to do so, under the inns there was usually storage for valuables for travelers, and while in Nordvorn in particular, a dungeon might be out of place . . . it might not. But what if you can’t afford the inn? What if you don’t want to stay there? Gestrisni. Afer the fall of the dragon empire, the subjugated populations—humans, eldhuð, captured elves and half-elves, and others—ﬂed south out of the Dragonground, with hordes of dragon-men, eðlafolk, and gangaeðla in pursuit. Those caught might be re-enslaved, or killed and eaten. Settlements and fortifications were hastily erected, and a custom grew of allowing any traveler to take refuge inside a compound. The words for “traveler” and “refugee/fugitive” in the Norðlond language diﬀer only slightly, with “moving from one place to another” and “ﬂeeing being turned into an hors d’oeuvre” being relegated to context and aspiration of certain letters. In any case, a long tradition of guest-right (gestrisni, or hospitality) in others’ homes took root over time. Gestrisni is not a triﬂing thing—by requesting it, one is stating that the host has something you need: protection. The host provides shelter; the guest promises to stand fast in the home’s defense. In more modern times, with Nordlond being somewhat more civilized (depending on whom you ask, of course), gestrisni is usually requested or oﬀered within those of a common background and social status. A party led by a follower of The Snow Queen of no special wealth or nobility might reasonably request gestrisni of a shopkeeper or successful farmer from within the braeðralag of the Snow Queen. A husgjof (house-gif) of food, drink, or some tangible useful object is usually oﬀered each night. In practice, this is the cost of living for your Wealth level, though it is never paid in coin, as that would be insulting to the host. I first tried to capture the bulk of the fortress. Squat and imposing, I hoped. The scale isn’t great on this, mostly that the walls are thicker in cross-section than shown. If I had time and a 3D modeling program, I’d be able to do this easily. Connecting the keep to the Lower Town across the river gorge – which I realized as I worked had to be MUCH wider (and the river MUCH deeper!) than I’d initially conceived it – is the Eternal Bridge. It actually anchors into the wall of the keep side, perhaps 30m below the magically-raised location of the Citadel on the north side of the gorge. Counter-weighted lifts bring goods and travelers from the lower docks, and the winding and defensible stairway, called The Spiral, takes you from the gates in the gorge up to inside the keep itself. That’s probably enough, though I do have more that I gave my artists. But if you really want to know where the money’s going on The Citadel at Norðvorn: it’s here. Taking my crude visualizations and power-point doodles and turning them into high-quality artwork and maps for you to use. Citadel at Nordvorn is currently on Kickstarter, and more than halfway to the funding goal. If the above strikes your interest, please consider pledging! Most of the book will be system neutral, and applicable to any fantasy RPG. I’m going to be on two more shows in the next two days! I will be one of the hosts tonight at the RPG Coast to Coast at 9:00pmEST//8:00pmCST//7:00pmMST//6:00pmPST. It’s going to be held in the Tenkar’s Tavern Discord chat. Even so, we will be chatting on his D&D Neighborhood channel at 6pm Central time, Saturday Feb 23. We always have fun. Morning! As we head into what will be a heavy writing weekend for me on Citadel at Norðvorn, I wanted to leave you with two podcasts. Che and I talk for about an hour, and cover gaming stuff both old and new. I return to their show for the third time. We cover what’s gone on at Gaming Ballistic since HoJ, being nice to customers, and group stealth rolls . . . plus a bunch of Nordvorn sporadically through the show. Return to Norðlond with a mini-setting by Gaming Ballistic. Response to the first journey to Norðlond, to find the Hall of Judgment, was outstanding, and introduced players of the Dungeon Fantasy RPG to Isfjall, a city in the depths of the barbarian north. Now, journey from Isfjall to Norðvorn, the magnificent castle and town that anchors both Audreyn’s Wall and The Palisade. From the northeast, the dragonkin threaten; from the northwest, the Hunted Lands are simmering, and about to boil over with hostile faerie. And of course the peoples of Norðlond are troubled by scheming, demons, and schemin’ demons. Citadel will contain three large settlements: Norðvorn itself, home to 7,500 residents including the Castellan and the Wardens. Longbru, opposite one of the sallyports in Audreyn’s Wall, a town from which many adventurerers depart into the Dragongrounds . . . but not all return. And Ainferill, a town in turmoil after the tragic “accidental” death of the Jarl’s wife and adult son. It also spends some time to talk about what is between the big settlements: details on some sample villages, many important NPCs and what they care about, and a tangled web of danger and deceit that the PCs can engage with, or not, as they choose. 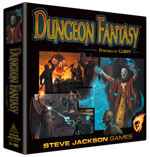 Citadel is a mini-setting for the Dungeon Fantasy RPG, again licensed by Steve Jackson Games to Gaming Ballistic. It will contain the locations above, plus important and not-so-important people and factions, each with their own goals. The entire region is about to burst into chaos . . . can the PCs find out why, and help contain the coming dark? Citadel is planned for 80 pages, but I probably have enough content for 128 page or even 144 if things go very well. Stretch goals will add content in 16 page increments, improve the quantity and quality of art. As before, the book will be softcover and in 8×10″ format. If you liked Hall of Judgment, this book’s production values will be at least as good. I hope you will join me, as before, in spreading the word and helping this come to life. I always feel better when I’m working on something that, while not final, is at least good enough that I feel comfortable showing it about. Today, I spent a lot of time pounding on the layout and look of the next book: The Citadel at Nordvorn. This is what I came up with, and the basic look which which I’ll go to Kickstarter but it’s been modified since the original. The new look is reproduced below instead! The pagination circles will probably become either towers or (more likely) gate-houses. The sword on top will be re-done in Illustrator or by a professional render, because at the moment the look is OK but it’s not an image that I can use other than a placeholder. The color scheme is very beige, and a better graphics pro than I am will help with contrast and readability, though most of the elements are OK. In short: it’s not bad, and will get better, but it’s solid progress on delivering a good-looking book. I wanted it thematically related to Hall of Judgment. This qualifies. I also wanted it different than HoJ, and this also qualifies. Tomorrow needs to be a real writing day, but I know what I have to do. I now have layout chapters where before I just had a wall of text. I have a look that makes the book distinct, though different elements may wind up being final, and those could be very different. I tentatively have six sample characters and a bunch of monsters in there, and while I cut the stuff from the HoJ bestiary that wasn’t there, there’s still a lot of placeholder for things that might be there but may or may not need writeups. I’m looking to make this one shorter, not longer, unless the Kickstarter does very well. There’s almost no way I can bring the entire thing in at 80 pages . . . but 96 or 112 is probably doable, and there’s content enough for 128 easily if the crowdfunding goes well. I managed to get my “year in review” out on January 1, which is really quick for a year in review. Now, even more importantly, it’s time to look forward. While “do more with the games I have” is in the cards, publishing and growing my business is about new content. So without further ado, here’s my tentative publishing and crowdfunding schedule for 2019. There are certain things that are either contracted or have already an agreement in place but signatures pending. What are those? Some you know, some you don’t. 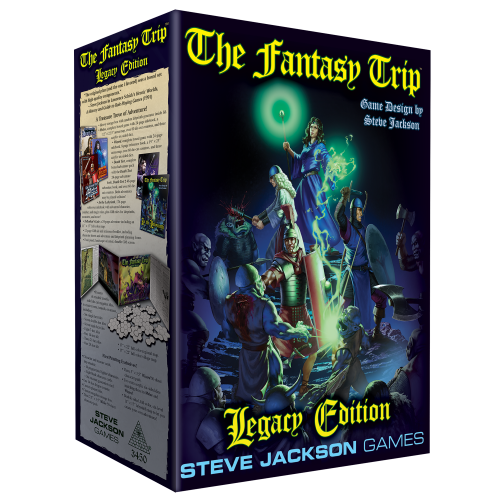 I did announce this in various channels, but Steve Jackson Games and Gaming Ballistic struck a deal similar to the one we made on the Dungeon Fantasy RPG, allowing me to produce 3rd-Party content under license for The Fantasy Trip. The TFT projects are up to 10 short adventures, which will be a color cover, black and white interior, and 16 pages long each. It would be insane to crowdfund one of these each month, and they can be produced reasonably quickly, so I’ll do them in batches of 4. If the first two campaigns do well, I’ll solicit for more authors for more projects. I’d love to effectively get far enough along on these, and have them be popular enough, to release one per month until SJG and the buying public get tired of them. Additionally, I’m very excited about the new Dungeon Fantasy RPG projects. Nordvorn is the one I’m writing now, and I’ve now pretty much cleared my plate of everything but finishing the draft. When it’s close enough to done that I don’t feel like I’m in a panic, I’ll launch a Kickstarter, but I really want that to be in February, which means I’ve got about two weeks to polish up the draft. Given that I’ve already written 42,000 words and I don’t think the market will bear a book larger than about 80-112 pages, this means anywhere between zero and 17,000 words in about two weeks, which is completely doable. The other two Dungeon Fantasy RPG projects and all of the TFT ones aren’t being written by me as author. I’ll manage the projects, get art, edit, and do other publisher-type things. I’ve got nice contracts in place for all of these, including a feature where the pay scale rises for the authors as the number of backers increases. I hope they max out! In any case, I’ll release more tidbits as I can. The “Print Available” line assumes a no-time-lost turn on an offset print run. If the demand isn’t sufficient to print the titles offset, then print availability will be a month to six weeks sooner, as digital short-run printing is faster but more expensive. Any offset runs will see books go into stores beside the core books, though, so I’m very excited about that. I hope that folks join me in making that possible. This represents a very aggressive schedule for a one-man shop plus contractors. If Citadel and the first TFT crowdfunding go as well as I hope they go (without being irrationally exuberant! ), though, it means that there will be a stream of funds available from sales of those books that I can get a head start on the rest, and that turns an aggressive schedule from one of stress to merely one of project management and risk assessment. I’m good at that. Five for five Kickstarters on time, or even early to promised schedule. Also, the Print Available release schedule is geared towards “not the kickstarter.” I suspect backers will get their print stuff all on the first date, but if there’s a retail release, it’ll follow the stepwise schedule so folks can see something new from me each month on the store shelves. Even so, if these projects take flight at all, and Nordvorn and its children do as well as Hall of Judgment, and if the TFT content is half as well received as the TFT Adventures project, it will give a great start on getting the next ones going, and if they achieve the same success that the TFT Adventures do, the line becomes self-sustaining. That represents my intent. Real life and the slings and arrows of the real world may conspire to move things around . . . but this is what I’m aiming for. Five crowd-funding projects this year, each effectively launching when the PDFs go out for the one before. Once that happens, the printing is somewhat on autopilot – barring disasters and lost shipping containers, that’s just time. My printing partners of choice are top-notch, so I’m not worried on that score. Is that “all” for 2019? Maybe, maybe not. I suspect so. I think I’ll be quite busy enough! The next installment in the licensed adventures for the Dungeon Fantasy RPG is starting to really come together. Look for The Citadel at Nordvorn soon! I’ve got over 42,000 words written so far, and in super-dense text format (no art, only the barest of layout, and a very temporary background) I’m at 650 words per page and 66 pages. The usual with-art layout is 500-550 words per page, which means the final document would be something like 78-86 pages were it done. In Hall of Judgment, I set up Isfjall as “Town,” where you buy and sell your stuff, and it served as a jumping-off point for the quest to find the titular Hall. Nordvorn is going to be a bit different. Yes, there’s Town. And nice GMs will tell the players which that is. But there are many other potential settlements to explore, and all of those are very much not Town. There will of course be monsters to fight, ruins to explore, and bandits to kill and take their stuff. There will also be a tapestry of personalities and culture to play in, and if you liked what you got with Isfjall for Hall of Judgment, well, you’re going to get a whole lot more of it with the Citadel at Nordvorn. Bear in mind that everything about the presentation of this will probably change. The image is just a simple background of a castle done up in Photoshop; the real background and graphic design will be similar enough to Hall of Judgment that you will know they’re related, but different enough to set it apart. But it’s much easier for me to pick apart words on a page than it is to stare at a screen, so I dumped it into layout and now I can see what’s going on. Nordvorn itself, both the Citadel and Laegribaer, the lower town. I cannot wait to get an artist to detail this up. I’ve got a really crude sketch of the city and town in, well, PowerPoint. I’ve also got notes on what braethralag (brotherhoods devoted to the same god) cluster where, temples, craft districts, etc. Note that the Citadel is not necessarily “Town,” and that betrayals, violence, and things that aren’t rest, study, and buying and selling stuff can happen there! Geitur Dag (October). A festival peculiar to Norðvörn—and peculiar in general, really—Goat Day. Each year, the Lower Town goes absolutely mad for goats. Goat costumes, fermented goat milk, goat races, head-butting competitions, and the animal husbandry competition to see which pair of goats will be dubbed Tanngrisnir and Tanngnjóstr (the goats that pull the Thunder God’s chariot) for the day. Alas for the winners, at the end of the day, they get eaten by the Hamar and Steðji of the Thunder God’s temple. Two neighboring towns, one of which very much is “Town.” The other is Ainferill, and there’s . . . a lot going on there. Little of it good. Violence, betrayal, cult activity, and a tangled web of intrigue. Plus folks to kill and stuff to take. Good times. This is a piece I commissioned a long time ago for Dragon Heresy . . . but from the moment I set it down, I knew it was going to be one of the plot points in Citadel at Nordvorn. There’s also Longbru, which is home to a dwarf-made bridge that spans the Jotunnain river for over a mile (thus: Long Bridge), and the opposite end terminates at one of the few sallyports in Audreyn’s Wall. Naturally, Longbru hosts many adventures seeking glory in the Endalaus Forest . . . and can be considered “Town” as per Exploits! With the relationship web already written, and the nouns coming together (Places, People, Things), I’m hoping to get to the point where I feel comfortable launching a project in a few weeks. That will be the first of three Dungeon Fantasy RPG projects, all set in Nordlond, and all planned for PDF delivery, if not print, in 2019. I’ve got some finalization to do on another project first, but when that’s done, it’s all Citadel, all the time when it comes to writing. Unlike many of my prior projects for the last bit of time, though, Nordvorn is going to feature virtually zero re-used art from prior books, unless it’s absolutely on point. So you’ll get to see the graphic design and maps and imagery take shape more or less at the same time as I do. Stay tuned! I hope you will have as much fun exploring this, which is the beginning of an extended look at Nordlond, as I am having writing it.